The National Society Public Speaker Program was set up to encourage our Centres to organize and host public talks and presentations, by speakers from outside their local area, about astronomical and related topics. 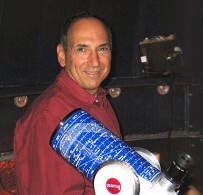 This spring, eight centres will participate in a rare speaking tour by RASC member David Levy. A long time observer and author, David has been observing for most of his life, has discovered 22 comets, written 34 books and is an RASC Chant Medal recipient. Join us when eight centres of the Royal Astronomical Society of Canada (RASC) host a rare lecture tour by famous astronomer and comet-discoverer David H. Levy. Attendance is complimentary (*exception); seats on a first come, first-served basis. Please see city, date and time, venue location and contact information below. OTTAWA — 2013 May 31 at 8:00 p.m.
MONTREAL — 2013 June 1 at 8 p.m.
KINGSTON — 2013 June 3 at 8 p.m.
TORONTO — 2013 June 5 at 7:30 p.m.
KITCHENER-WATERLOO — 2013 June 6 at 8 p.m.
MISSISSAUGA — 2013 June 7 at 8:00 p.m. Please visit http://www.utm.utoronto.ca/evening-david-levy to register. HAMILTON — 2013 June 8 at 6 p.m.
LONDON — 2013 June 9 at 6 p.m.